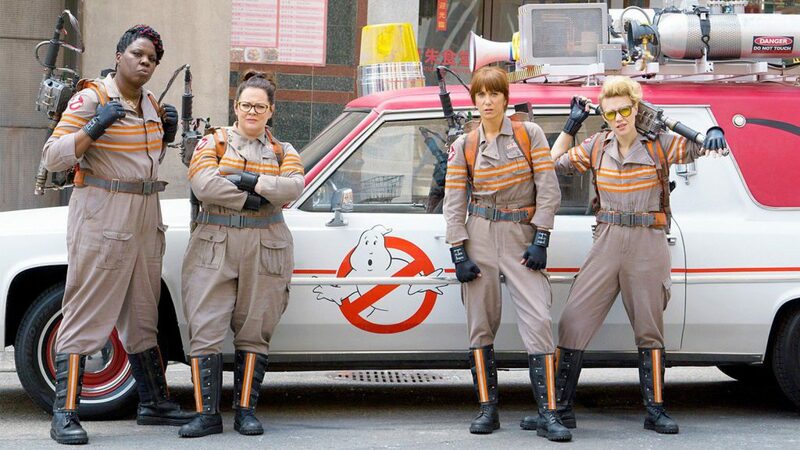 From Left to Right: Leslie Jones, Melissa McCarthy, Kristen Wiig and Kate McKinnon in “Ghostbusters” (2016). Courtesy of Sony Pictures Entertainment. Filmmaker Paul Feig (Bridesmaids, The Heat, Spy) has once again assembled an all star cast of top comedic actresses for another Hollywood comedy all-timer, this time a reboot of Ghostbusters. Many of us at Endurance managed to catch the movie over the weekend and walked out fans of the newly re-invigorated franchise. One of the stars of the films turned out not to be relegated to the case but the rather elaborate production design (a big step up for this group of filmmakers) including the newly revamped “Ecto-1” the iconic vehicle our 4 heroines drive on the way to bust up some ghoulish spirits and have us laughing and thrilled the entire ride. 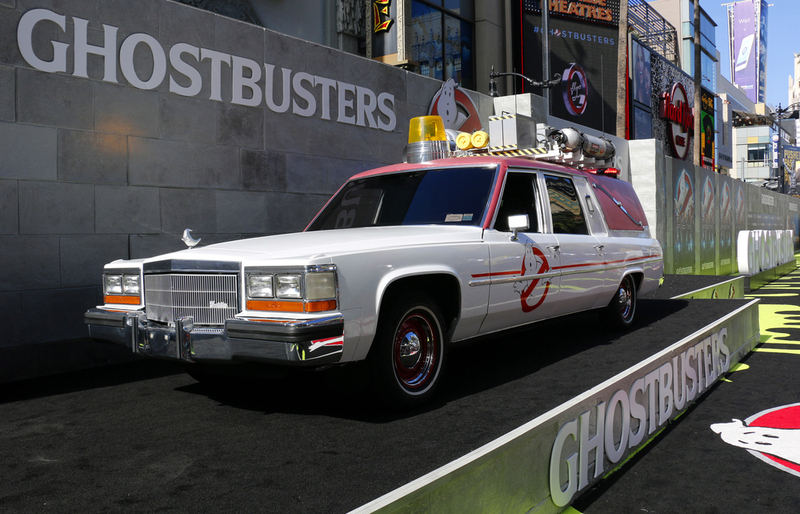 This movie features a number of updates from the 1984 film, both in the new cast and in 2016 mega budget effects but the Ecto-1 has been upgraded from the iconic 1959 Cadillac ambulance to a 1982 Cadillac DeVille hearse. In all honesty, it’s kind of more befitting for battling legions of the undead. Many movie goers these days may not remember the original 1984 film as clearly as they did before but still the imagery of the original 1959 Cadillac ambulance which was then outfitted with sirens and equipment that the team would need to capture and remove ghosts. 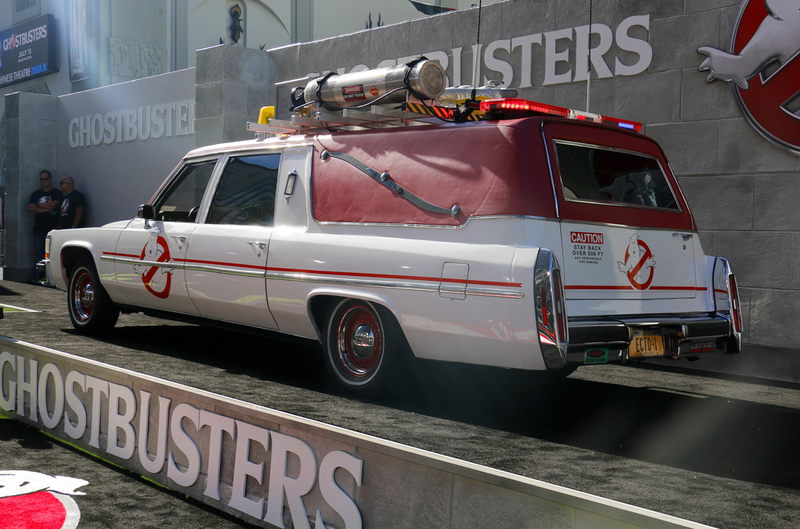 This car that Bill Murray, Dan Akroyd, Ernie Hudson and the late Harold Ramis rode into battle against their ghostly enemies remains an iconic image ingrained in the American pop culture. 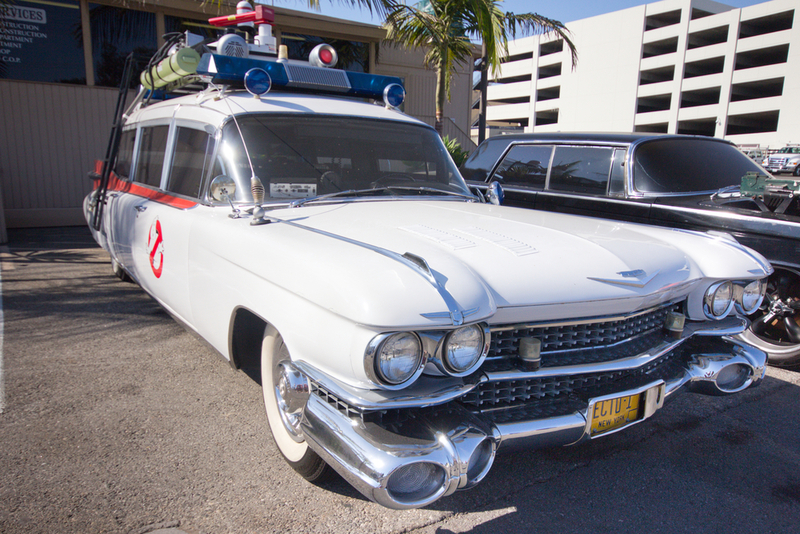 The car,“ECTO-1;” as in “ectoplasm,” which is a made up term for fictional ghost blood, continues to make sporadic appearances at car shows and theme parks, particularly around Halloween. For the new movie, ECTO-1 is also a Cadillac again, and it’s a Reagan-era Fleetwood hearse—probably something that would have actually been in service in real life while the original Ghostbusters was in theaters. A few fans were disappointed that the original Ecto-1 was not used in the new movie, but keep in mind that the new Ecto-1’s original body was built 30 years before the movie begin just as the original car was 30 years old before it was turned into the original Ecto-1. And besides Ecto-1’s new look as a car that is clearly a hearse, instead of the more ambiguous previous model, is much more fitting with the ghost motif. Under the hood lies Cadillac’s new-for-1982 HT 4100 V8 engine, which features what they referred to as “digital” fuel injection. It had 135 horsepower and 190 pound-feet of torque which may not seem like much but actually looks surprisingly zippy on film. The car is introduced early in the movie in a scene that actually outdoes the original in terms of laughs but like the titular ghosts themselves, there’s quite a bit of movie magic afoot . At first glance, the car may seem like an old body on a newer chassis, but that’s actually quite convoluted even for movie making. So what happened was the production designers built the car just for this film. Everything from the ghost hood ornament to the hilariously oversized emergency light and what look like soda kegs mounted on the roof, the new ECTO-1 may not be as immediately eye-catching as the original movie’s car (Cars from the ‘80s rarely were as striking as ones from the ‘50s but you can sense an attention to detail that is on par with even the newer Mad Max or Fast & Furious cars. In the world of the film we soon discover a lot of the gadgets on the car nuclear, so the car is ready to fight with the Ghostbusters…or blow them to smithereens and not just take them where they need to go. We can’t revel much for fear of spoilers but I’ll just say that this vehicle gets a chance to shine in ways that the original never really did. So no, it’s not the original, which will always make Ghostbusters “purists” throw a fit, and yet we think this new Ecto-1 is more than capable of reaching the iconic or toyetic profile of the other model. To be fair, you’re seeing this new Ghostbusters movie for the delightfully hilarious cast of Kristin Wiig, Melissa McCarthy, Leslie Jones, Kate McKinnon and more and because you want to see some gut busting ghost busting action and laughs (peppered with a few chills here and there) but the fact that we now have a new iconic movie car to go along with it only endears us gearheads at Endurance even more!